Sportaid presents the weight champion Portable Pro Lift. If you are worried about finding a lift that can take your weight comfortably then your search stops here. It is ADA compliant and hence recommended for commercial use. The patriot is created with many amazing features that make it a perfect choice for anyone looking for a perfect lift. The lift’s design has been improved in recent times giving it even more fantastic features. The lift has a weight capacity of 375 lbs (170kgs). It comes with a rechargeable battery with a wall mount charger; it ensures that your lift is powered every time anywhere. The flip-up armrests that this lift has helps you to transfer in and out of the chair safely. Adjustable Lap belts further enhance your safety by ensuring that you are firmly secured in your seat. The water-resistant handset makes it easy for you to operate this lift. Removable and adjustable footrest ensures that your comfort comes first you can adjust the footrest or remove it altogether as you may desire. The lift is made of stainless steel. This material is long lasting, the powder coat finish give it a durable and attractive look. 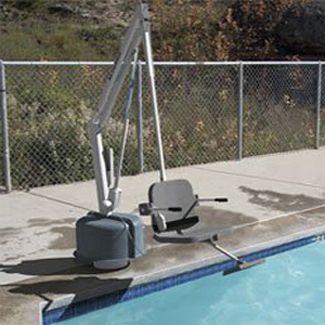 The PAL Portable Hi/Lo Lift can be adjusted for use in an in-ground pool or on a pool that is on a high ground. The seat comes with both high and low settings to suit facilities with both types of pools, you should note however that the lift cannot directly transfer you from an above pool to an in-ground pool. The lift has fantastic features which I will focus on in this post. It has a weight capacity of 300 lbs; fairly heavy individuals can use it comfortably. The lift is absolutely portable as the name suggests and it, no deck fixtures are added therefore can be easily moved by one person. It can be stored away when not in use. A 24-volt rechargeable battery powers this awesome lift. You can operate this lift by a waterproof hand control that is simple to use. This lift features a 240° rotation. It ensures your safety by giving you a safe transfer area. The lift is made from strong, durable material. Aluminum and powder coated stainless frame and seat is sturdy and built to last long. The seat comes with a charger, a battery console cover. Your safety is guaranteed with the seatbelt assembly that comes with the lift. Using the bathtub may become a struggle for you as a wheelchair user. However, there is an assistant who will help you enjoy bath times in comfort. The Able Aquatic Bathtub Lift Elite by Aqua Creek available at Sportaid is a bathtub lift that is built to make your bathroom moments comfortable. It comes with amazing features that will make you fall in love with it. Let’s delve into the next. The lift has a weight capacity of 300 lbs. It comes with a seat belt; this ensures that you are safe in this lift. It is unlikely that you will fall off and get hurt. 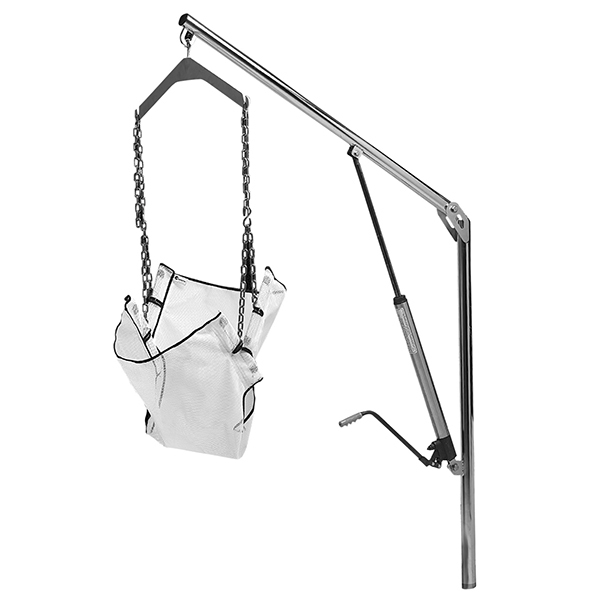 Created out of a stainless steel frame, this lift is made to last long. The powder coat finish gives it the perfect look. Controlling this lift is easy. It has a remote control for that, the remote control is waterproof hence no fear damaging it when gets wet. The seat is wide enough to accommodate even big sized individuals; the 17″ seat will still offer them the comfort they require. 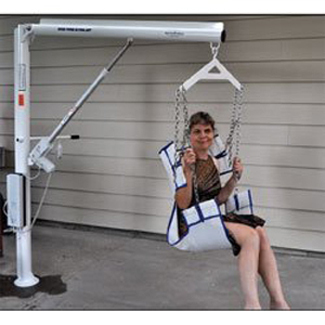 Experience the power of the Super Power EZ Lift by Aqua Creek in every lift at your pool with this incredible lift that has excellent features. The lift is made to give you accessibility to above ground pools and spas at economical prices. The lift offers you the option of sitting on a mesh sling seat or a hard one. It is built to serve you for a longer period of time as it most reliable lift. Before we learn about the pros and cons of this lift, let us focus on the features of the Super Power EZ Lift by Aqua Creek first. It has a weight capacity of 181 kg (400 lbs); most individuals can comfortably sit in this powerful lift. The adjustable stainless steel chains enable you to adjust them to the length that is most comfortable for you. You can either choose to use the mesh sling seats or opt for a hard one that is as effective as this. Besides, the lift has a water-resistant handset it cannot get affected by water. And to ensure that you get the best out of the lift, the rechargeable battery with wall mount charger ensures that your lift is powered to lift you for all the fun you may need. The stainless steel construction is ideal for use at the pool; it won’t rust or get corroded by water. If you are struggling with finding the right pool lift your search stops here at Sportaid, it presents to you the Titan 600 Lift by Aqua Creek which has among the highest weight capacity in the lifts market today. And it does not stop here; the pool lift has other incredible features that I will share with you in this post. The lift comes with a 22″ extra wide seat, a perfect size that will ensure comfort even for the fairly large individuals. 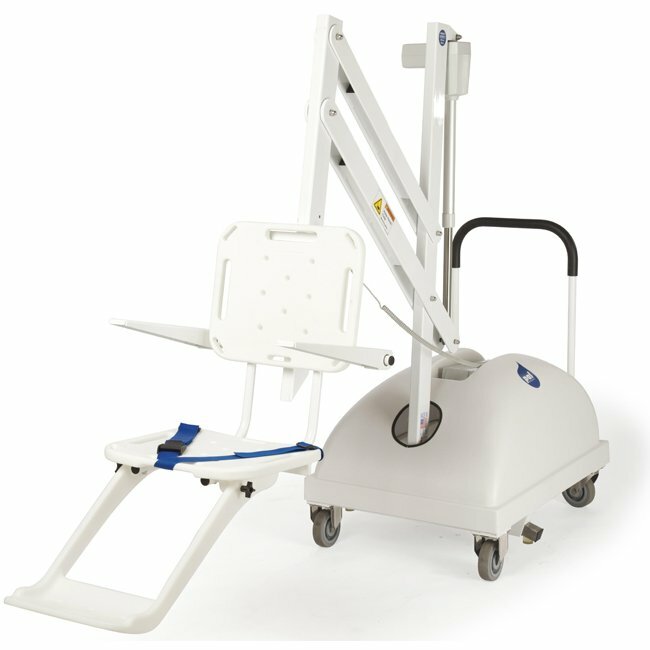 Dual flip-up arms are ideal for safe transfers, it is easy to get in and get out of the seat without risking falling off. 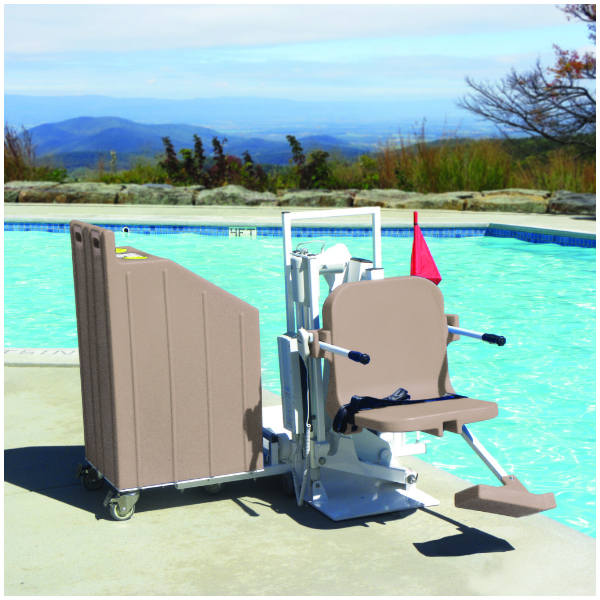 The lift has removable and adjustable footrests that ensure you sit comfortably and enjoy every moment at the pool. It also features a water-resistant handset which ensures the handset is not damaged by water with continued use. This lift has a rechargeable battery that can be easily charged, and that is not all, the wall mount charger further makes it super easy for you to charge it. The titan ensures that you are secure with the lap belt it has, the belt is adjustable so it can fit all comfortably. This amazing product is of the best quality. It is constructed from stainless steel which it does not rust or get corroded with time. The powder coat finish does not only enhance its durability, but it also gives it an elegant look that makes it an eye-catching piece. Manual lifts work just as efficiently as powered lifts. The Handy Lift is a manual hydraulic lift that is a piece you can purchase for your own residential use. It does not meet the ADA standards but that is not to say that it is not efficient, it is an ideal pick for use at home. Sportaid has this fantastic lift that comes with incredible features, keep reading to find out the detail of the features and why you should purchase it at Sportaid. The Handy Lift has a heavy duty mesh sling that facilitates safe and easy transfer to and from the pool. It is made of 1.90″ OD x .145″ wall stainless steel material, which gives it the ability to last long. The lift is operated by someone other than the user; it is easy and safe to do so. This lift has a weight capacity of 400 lbs. It is able to lift the heavy individuals comfortably without compromising their safety. It requires a semi-permanent installation; it can be easily removed from the anchor.